A Scuola in old Venice was not a school, but something like a kind of non-profit association or a brotherhood. Many had charitable purposes, others were forerunners of today's guilds, i.e. associations of all craftsmen who practised a certain profession. There were six large Scuole (plural of Scuola) and many small Scuole. A large association was called Scuola Grande. The Scuola Grande di San Rocco is today the most famous of the six former large associations. 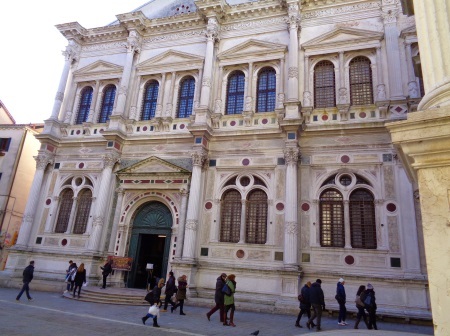 The building of the Scuola Grande di San Rocco is today a very important sight in the city of Venice. The Scuola Grande di San Rocco Venice is famous above all for its works of art, but the building itself also impresses visitors. Famous are ceiling paintings and very large pictures on the walls. While theceiling paintings represent scenes from the old testament, many pictures on the wall have the new testament to the topic. The 56 paintings by Jacopo Tintoretto from the second half of the 16th century are outstanding. The building can be reached on foot in less than 20 minutes from Venice Central Station. After having paid the entrance fee, you already stand in the second most important room of the Scuola San Rocco. In the big hall Sala Terrana, approximately 10 huge pictures of Tintretto hang on the walls. They show scenes from the New Testament, especially the life of Mary and Jesus as a child. Then you go up a wide staircase to the first floor. Also net to the staircase you can see beautiful paintings. The gigantic room on the first floor, called Sala Superiore, is more than overwhelming. It is without exaggeration one of the most beautiful rooms I have ever seen. Jacopo Tintoretto painted many years on the ceiling and on the walls. The pictures depict scenes from the Bible, both from the Old Testament and the New Testament. Especially the ceiling paintings are magnificent. We sat down on a chair and only looked at the ceiling for minutes. Several paintings on the ceiling of the Sala Superiore, which served as a kind of meeting room for the members of the Scuola Grande di San Rocco, show events from the 5 books of Moses. I particularly liked the painting with the miracle of the water in the desert. Almost all the paintings in the room are by Jacopo Tintoretto. The Sala Superiore was a large part of the life's work of the world-famous painter. The works of art date from the 70s and 80s of the 16th century. Additionally you can have a look into some smaller rooms in the "school" San Rocco. In an adjoining room on the ground floor there is a small bookshop and behind it a toilet for the museum visitors. In the book shop there are some good and inexpensive books about the Scuola Grande di San Rocco and about the works of Jacopo Tintoretto in English and other languages. A great idea are the postcards with different paintings by Tintoretto that can be bought in the museum shop for one euro. The building of the Brotherhood of San Rocco has no heating. We were in Venice in January and it was bitterly cold in the Scuola. Not far from San Rocco is the famous Frari church. The entrance fee is 10 Euro. Children under the age of 18 with their parents do not pay admission. Disabled people can also visit the Scuala San Rocco free of charge. Persons under 26 and over 65 pay the reduced entrance fee of 8 euros. The prices are from 2018 or early 2019. You can find the Scuola Grande in the middle of the old town of Venice. Very close is the Frari Church of Santa Maria Gloriosa dei Frari, one of the most important and beautiful churches in Venice. Opposite the school San Rocco is also the Leonardo da Vinci Museum. Those who have some more time in Venice can also go to the area around the big square Santa Margherita. Here one finds a Venice that is still Italian with a little less tourists, good restaurants etc. It is one of our favourite places in the lagoon city. Scuole is the plural of Scuola, so it means schools. There were also a large number of "small schools", Italian "scuole piccole" (singular Scuola Piccola). These were mostly associations of certain professions, such as guilds. Some of the many examples of small schools are wine merchants, doctors, tailors, fishermen, bakers, cheese shops, butchers and even simple activities such as garbage disposers or cloth collectors.